I'm a bit jealous and worried haha. My mom comes to my house once a week and recently Mochii wants to play with her and comes to her when called, she does this to NO one but her and my dad and she barely sees them. She still runs when I go to pet her or pick her up... Why is this? I'm not mean to her I feed her walk her etc. Is this a phase... We love Chi (short for Mochii, Anyone have advice? I mean I never hit her, I do punish her when shes being bad like chewing on wires etc, but never hit her... any suggestions. Probably because your mom is a treat a once a week thing? Saya acts very happy and excited whenever new company comes, but never goes excited for me like she does for guests. She shows her affection with me differently. As she grew she got more excited with me coming home from outings. Probably your pup be same. Some dogs just like some people more. I wouldn't worry about it and just continue working with the pup exercising and training. Saya is very bonded with me, but I guess she is more cool and collected with how she is with me which is fine by me. Between your Shiba and you, the one who cares a bit more about the relationship than the other is the loser. It's a tough game, a difficult balancing act, but you will learn to play it. @tatonka haha, I know... so you think this is normal for a shiba? @Saya the thing is, its ONLY my mom and dad she doesn't like other people... haha will she understand after she grows up or...? This is normal. Grandma and Grandpa are "fun". You are not as fun because she sees you everyday. Its just like human children that love going to see their grandparents because they get spoiled there, ya know? What about being afraid of other people when we walk her etc. is it because its at my house? so you think this is normal for a shiba? Afraid what do you mean is she acting aloof? Like meh I'm not into you or afraid like running away from the person acting scared? Did the pup always act afraid of people at young age? Saya loves people she loves going to events been to cancer walk with probably 100 of people probably even more! Coarse I kept Saya in less crowded spots and held her when we had to go through crowds.. She got tons pets at the cancer walk. There is some people she is aloof with she'll just stand there ignore them and go off smelling things. Like meh you can pet me if you want, but I'm not going to go nuts like I do with people I like..
Saya went with me to family birthday parties, to park, too events, farmers market, coffee place, local bar/grill with outdoor seating. She is a confident puppy, but still I gave her a lot of socialization opportunities. She meet a big group of kids once from a daycare.. staff had the kids meet her one by one so not to overwhelm her. Each dog is different so some might be more timid and need more time to work with. @shawn4455, can you describe more what you mean by afraid? Is she cowering? I originally thought that Tatonka had developed fear when he started barking at male strangers. Since then, looking at it a bit deeper, it's obvious that he's curious about people and will come right up them giving them eye contact and even touching them. The barking starts when the person actually wants to touch back, and even then he sort of just stands his ground doing a howl. I would suggest you test how your Shiba is when given treats from strangers. Try and figure out first if Mochii is afraid, cautious, protective, etc. Then figure out what the situations are that trigger how she feels: inside the house, outside in crowded places, on the street. etc. Then figure out how much she's willing to "give up" the behavior for a reward, ie: a treat, thrown ball, etc. I have another question, I've posted on my introduction that Chi is very skittish and afraid and she has kinda gotten over most of it, she still kind of jumps when she is about to be touched but its either she wants to play or doesn't want to be picked up. But she is still a bit scared of certain things like her leash for that matter she will un curl her tail and lay down or when other strangers approach her, how can i get her to be more social or more like a puppy that likes people? she likes playing with me but is afraid of some people or most. Have you been socializing her with people? Chi is only 3 months right? She should be outgoing and playful with everybody. Have you been desensitizing her to the leash? How much research have you done prior to getting Chi? We have many helpful threads, I'd suggest you read through the puppy woes. We do socialize her with the family, my parents and fiances family, we havn't taken her out to meet new people yet because she finished her last parvo shot and she has a rabies and shes done and I can take her out. If you wait til she gets all her shots, then you will miss the crucial socializing window. Best way to socialize a puppy is to meet new people in new environments. If you only socialize her among family, that is not enough. Take her to places that allow dogs, but avoid high dog traffic areas. Also introduce her to your friends dogs that you know are fully vaccinated. Like bootz said socialization should be done early not when shots are done. I took Saya to friend's house, family parties, met neighbor's and went to starbucks near me I kept her on my lap and she got pets from people. 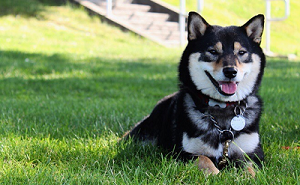 Some shiba are skittish by nature, but Saya was very confident as puppy I only had one shiba as pup so not sure what is common for the breed as pups. I did puppy class sometime between her shots she only had one shots while I had her and went to farmers market. since farmer market was high traffic I held her. I took her to lowes too some allow dogs inside. ask before you take the dog in.. I been to three lowes around my area and they all allowed Saya. Coarse be sure the dog had potty in grass before going in don't want cause accidents or bring wipes to clean it up. Tractor supply, and I think rural king allows dogs. Place that has high dog traffic I'd be careful of or just hold the dog up. Well shes done with her shots and I took her out today, I sat a public place and waited for people to noticed "she looks like a fox" and people pet her etc etc, she was scared at first and shook a lot, but after a few people and her observing she wasn't shaking, not saying she liked it but she wasn't shaking any more or as much, how many times a week do you think I should take her out in public places?? As often as possible! Especially if she was scared the first time, you want her to get accustomed to and desensitized to strangers, trips in the car, and outings. I religiously took Kira somewhere every weekend and still do at 7 months. Sometimes it's just a trip to a friend's house who owns a dog for dinner/game night/puppy playtime. This is pretty typical of Shibas. Mine is fairly loving towards me for the breed, but every time my parents come over he goes into high energy mode and won't stop prancing around and wagging his tail. Like others have said, it's because they grow fond of people they don't see every day, and are more likely to react more strongly to them. Mine just looks at me when I come home now, and eventually wanders over to me, simply because he's used to me always being around. @Zantastic, you don't get airplane ears when you get home?? Maybe it's just me, but if I go upstairs to put laundry away or fix my hair for over 5 minutes and come back down, Kira is beside herself, she is so happy to see me return. She wags her tail hard from one side of her back to the other frantically and jumps up to greet me. It melts my heart every time. Why would cold water be bad? I don't know someone said that they vomit, I heard it from someone I dont know who. which brings me can Shibas drink cold water?